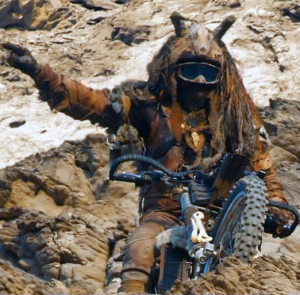 The Rock Riders live in the canyon and ride around on dirt bikes. 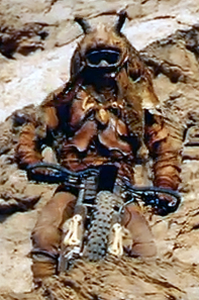 They wear tan leather trousers, tan shirts with strips of frayed brown fabric sewn to them, furs, helmets, and goggles with mesh or knit fabric hanging from them. Bones are used as decoration. 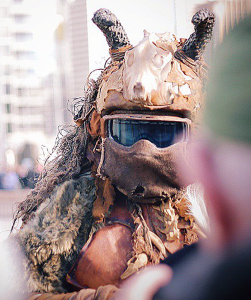 The Chief is wearing Scott Tyrant goggles with the ACS-series vented lens. Other riders are likely wearing Scott Hustle goggles, also with the ACS series vented lens system. 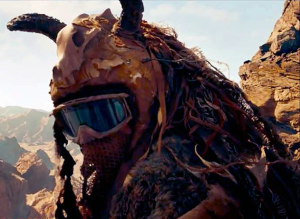 Please note that the goggles have been subject to slight redesigns since the costumes were acquired. Some wear motocross knee braces, which are Matrix Pro knee braces (not to be confused with their Matrix Pro medical knee brace). Here’s a Youtube video of Australian motocross rider Chris Urquhart talking about the braces. The braces were painted tan for the costumes. 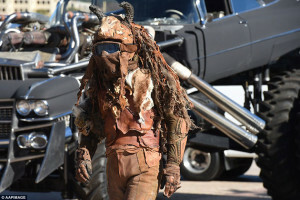 The chief’s helmet has horns that are made of mountain bike tire tread, ghillie-style camo hanging over the back (burlap strips, leather strips, and perhaps strings). 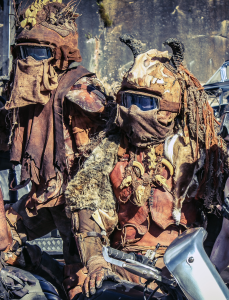 The skull on top appears to just be a sculpture that blends into the shape of the helmet, with the eye and nose holes painted on. 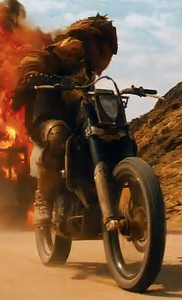 His helmet is covered in leather, with some of it cracked and worn off. 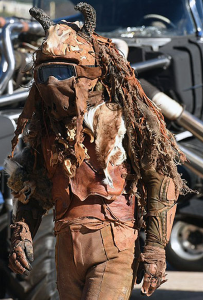 Some of the photos below are from the Sydney Opera House display, and show some very good detail of some of apparently screen-used costumes. 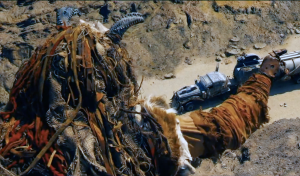 Just be aware that the stuntmen are not wearing the exact combination of items worn in the film. 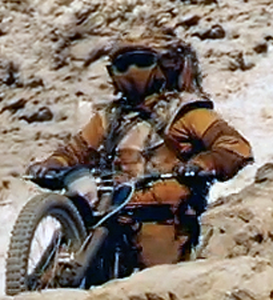 One stuntman can be seen wearing an armored jacket, painted tan. 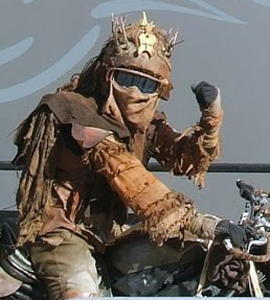 If you can identify the brand & model of the goggles, or armor jacket, please submit that here. A good shot of the leg braces. Large image with heaps of detail!